next time on the roads, don't scoff at the speed-breakers. They could actually light up small villages off the highway. An amateur innovator in Guwahati has developed a simple contraption that can generate power when a vehicle passes over a speed breaker. 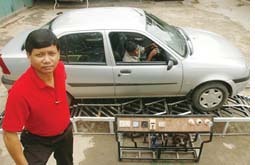 Kanak Gogoi, a small time businessman, has developed a mechanism to generate power by converting the potential energy generated by a vehicle going up on a speed breaker into kinetic energy. The innovation has caught the eye of the Indian Institute of Technology (iit), Guwahati, which will fund a pilot project to generate electricity from speed-breakers. The idea is basic physics. Gogoi has welded five-metre-long metal plates into the speed-breaker instead of the conventional bitumen-and-stone-chip rumble strip. The plates are movable and inclined with the help of a spring-loaded hydraulic system.The fulcrum-attached plates are pushed down when a vehicle moves over them and bounce back to original position as it passes. "When the vehicle moves over the inclined plates, it gains height resulting in increase in potential energy, which is wasted in a conventional rumble strip," Gogoi says. "When the plates come down, they crank a lever fitted to a ratchet-wheel type mechanism. This in turn rotates a geared shaft loaded with recoil springs. The output of this shaft is coupled to a dynamo to convert kinetic energy into electricity," he explains. iit Guwahati has evaluated the machine and recommended it to the Assam ministry of power for large scale funding. A K Das, a professor at iit's design department says it is a 'very viable proposition' to harness thousands of mega watts of electricity untapped across the country every day. "A vehicle weighing 1,000 kg going up a height of 10 cm on such a rumble strip produces approximately 0.98 kilowatt power. So one such speed-breaker on a busy highway, where about 100 vehicles pass every minute, about one kilo watt of electricity can be produced every single minute. The figure will be huge at the end of the day," he said. The Assam power ministry is expected to back the iit pilot project. Das says a storage module like an inverter will have to be fitted to each such rumble strip to store this electricity. The cost of electricity generation and storage per mega watt from speed-breakers will be nearly Rs 1 crore as opposed to about Rs 8 crore in thermal or hydro power stations.